A twist tie machine automatically applies and installs twist ties. They can be used to add twist tie seals to product packaging, such as bags, or to bundle individual products, such as coiled or wound cable. Many twist tie machines are capable of tying up to 60 ties per minute or more, providing improved packaging productivity in any application. 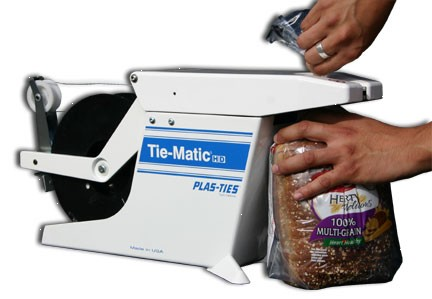 A Plas-Ties Tie-Matic HD38 twist tie machine. Plas-Ties designs and manufactures a full line of twist tie machines, including vertical and horizontal models with self-adjusting capabilities and all metal construction for durability and reliability in demanding applications.